Creamy and full of chocolate flavor, this hedonistic chocolate peppermint martini cocktail finishes with a cool, minty sensation reminiscent of an after dinner mint. An after dinner mint that's been imbued with vodka, that is. Love it? Be sure to give it a star rating! Shake until cold and well blended then strain into prepared martini glass. 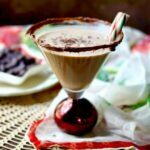 Dip the rim of the martini glass in melted chocolate then roll in crushed candy cane. Put in the freezer for 5 minutes. Remove the glass from the freezer and squirt a spiral of chocolate syrup around the inside of the glass. Return to the freezer for a minute or two. Pour the martini into the glass and garnish with a candy cane.